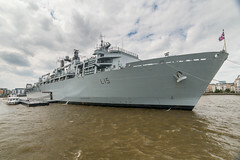 Walk to HMS Bulwark from Rotherhithe – Neil Baldwin's blog : Warning contains walking, technology, photography, holidays. London seems to be a weekly commute for me at the moment. This Saturday I have managed to get tickets for a tour of the Navy ship, HMS Bulwark moored up in Greenwich for a few weeks. To make a day of it I thought I would walk from Rotherhithe which will complete the walk I started last weekend when I walked from Rotherhithe to Tower Bridge. Waiting at Berkhamsted there were quite a few groups of people with picnic hampers clearly some outside event was on. The train was relatively busy but I got a seat with a table for the coffee I purchased on the platform. The train was running 7 minutes late. 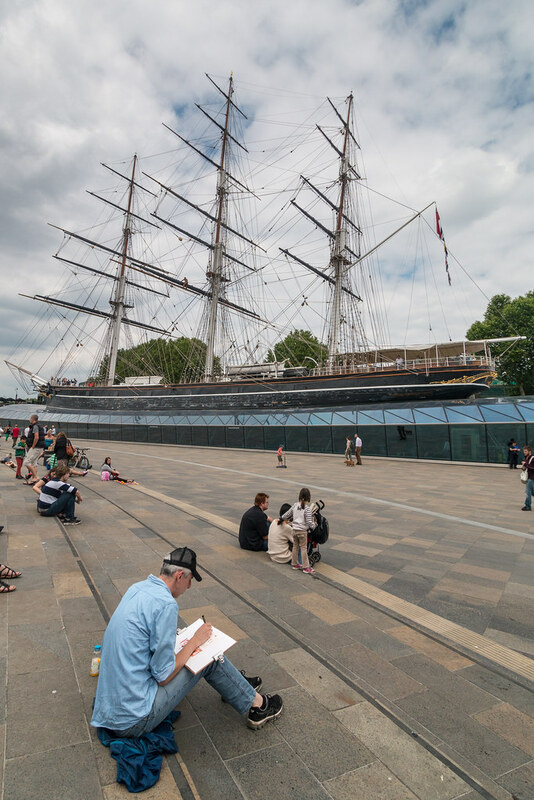 I chose to tube it to Rotherhithe, then I kept to the Thames path as much as I could, it turned out to be quite a long walk and at Deptford high street I thought about getting a bus but the next one was in twenty minutes so I carried on walking. 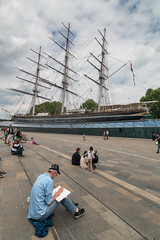 By the time I got to the Cutty Sark I was quite tired of walking. There was a sort of French market on and I bought A veggie quiche for lunch the whole transaction done in French. I followed that with a coffee and a pee at the Greenwich museum the cafe was a bar as well and brewed its own beer in the big atrium of a bar in big copper brewing things. I joined the queue at about 1245 for the 1300 trip. I had a spare ticket and offered it to a guy carrying a camera, I don’t think he really understood what I was offering him, he said yes bit then disappeared. Luckily for a young lady in the queue near me I was able to offer her the spare one. She had registered but could not get the eTicket up on the screen of her blackberry. Her name was Natalie and she was a bored commercial lawyer and was thinking of joining the Navy as a legal reserve? We were soon herded into a tent for 10 minutes of how great the Navy is and why we contribute taxes to the service which provides value for money. Then we were herded onto a jetty where our launch to take us to the Bulwark was waiting. Once on board I tagged onto one of the guided tours of he boat. 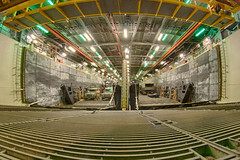 We visited the control room where they play war games the helicopter deck where we were able to go into the cockpit of the helicopter parked there. In the control room I noticed they were still using Windows XP that probably explains why the government has agreed to pay Microsoft for patches post them making the OS end of life. 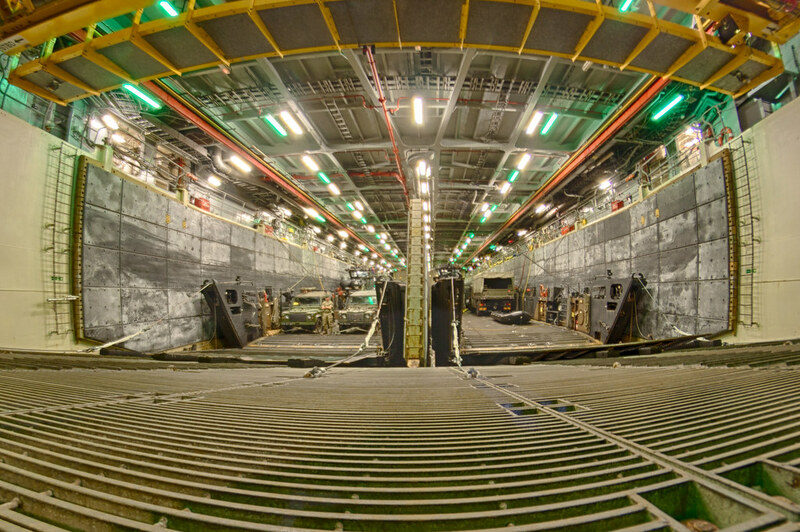 We also went into the depths of the vessel where we got to see the landing craft which can be launched out of the back of the ship. We were on board for about an hour and a half. Were were herded back to the pontoon to pick up the launch to take us back to land at the Cutty Sark. I was quite tired by this point so decided to take the most quick and direct route back possible. Google t0 the rescue, a Tube station was near by bit the line was closed further down the line so down 10 flights of steps on to DLR then off at the next stop up some steps, onto a bus that went all round the houses and eventually to another DLR station where I got a train to Bank, then the Northern line to Euston where I was two trains ahead of the Google suggestion. At Berkhamsted I picked up Helen who was shopping for dinner then we went home for Pizza and salad for me at least an early night. A tiring but enjoyable day.